TOUCH OF CREATION: CFS Cards!!! Beautiful cards Piali! Love the butterfly so much. Loving both of your creations today! Thank you for joining the Dreamweaver Stencils March Madness challenge. 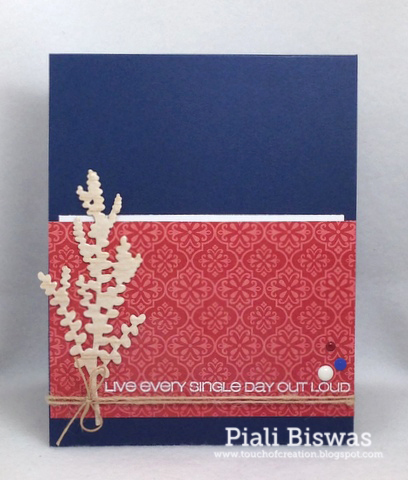 I absolutely LOVE the sweet simplicity and beauty of your wonderful cards, Piali. You are SO creative and talented, and I just want you to know how VERY grateful to you I am for sharing your wonderful art with us. God bless you, and please join us again soon. Beautiful cards. Thanks for joining us this week for "Anything Goes." Good Luck. Designs only attract more people and make good impressions on us among them. This is such a pretty card! Thanks for joining in with the Crafty Little Fairies Challenge this week! Both cards are lovely but I'm nuts about the butterfly card! Gorgeous! Thanks for playing along with us at Dreamweaver! Thank you for joining us at Crafty Little Faires with this wonderful creation! Yummy! The scale, the colours, the texture all in a one layer card! Well done! !